Samal, officially the Island Garden City of Samal (Tagalog: Pulong Harding Lungsod ng Samal, Cebuano: Pulong Harding Dakbayan sa Samal), or sometimes called IGaCOS, is a 4th class city in the province of Davao del Norte, Philippines. According to the 2015 census, it has a population of 104,123 people. It is made up of Samal Island and the smaller Talikud Island in the Davao Gulf, from the merger of former municipalities of Samal, Babak, and Kaputian. Samal is a part of the Metropolitan Davao area and is two kilometers away from Davao City, the largest city and the primary economic center of Mindanao. The name Samal was derived from the Sama-Bajau peoples, the natives who were the first inhabitants of the island. The first datu in the island was Datu Taganiyug, a native of what is now Peñaplata, today the governance center of the city. In the past, the people of the island name a place about what was the said place known for. For example, the name Peñaplata was derived from the word "piña" or pineapple because of the abundance of pineapple in the area. This, however, is folk etymology, for peñaplata literally means "rock of silver" in Spanish. Tagpopongan is the first barangay in the island which name was from the word "tagpo" or meet. It was so called owing to the fact that this place was chosen by the datus as their meeting place. The word Samal was also known before because it was commonly used as surname by datus. The island was initially home to the Sama-Bajau peoples, until eventually, Hindu influences from other southeast Asian vassal states were brought, followed by Islamic influences. Later on, Spain managed to conquer the island in the late 1840s when Nueva Vergara (Davao City today) was established. The Pacific War, which happened during World War II, struck the island. Japanese fighter planes bombed the island. Japanese forces occupied the island and forced the people to work for four years until they were expelled by the Allied forces. After the war, infrastructure was built, like schools, churches and stores in the area. The time came in July 8, 1948, when the entire island itself becomes part of the newly created municipality of Samal; it was the official founding of the municipality. Five years later in 1953, the municipality of Babak was created from Samal, marking the political division of the island between the two municipalities. Now came the political division of the island between the three municipalities, when the municipality of Kaputian was created from the island in 1966. In this period, the living qualities between these three municipalities became low and extremely rural. In 1969, a proposal to create the sub-province of Samal was created by Republic Act No. 5999 and covered the area of the present-day city. The act was enacted without President Ferdinand Marcos' approval. However, the sub-province was never inaugurated. The city was created through Republic Act No. 8471 in January 30, 1998. This act paved the way for the dissolution and merger of the three former municipalities of Samal, Babak, and Kaputian into one local government unit by turning then into districts, now officially named as IGaCoS, the Island Garden City of Samal. The first city mayor was Rogelio P. Antalan, who later served for three consecutive terms from 1998 to 2007. On September 22, 2015, Kjartan Sekkingstad, aged 55, from Sotra, Norway, was abducted by Abu Sayyaf Islamist guerrillas from a high-end tourist resort on Samal Island, along with two Canadian men, John Ridsdel, aged 68, and Robert Hall, aged 67, and a Filipina woman, Marites Flor, Hall’s girlfriend. In April and June 2016, the Canadians were beheaded after ransoms were not paid, and in June 2016 Flor was released. On September 17, 2016, Sekkingstad was released on Jolo island, 600 miles south of Manila after captor Abu Sayyaf received $638,000 in ransom for his release. He was handed over to another rebel group, the Moro National Liberation Front. The MNLF was in peace talks with the government and had been working with authorities to secure Sekkingstad's release. It is not known who paid the ransom for Sekkingstad, but it was not Norwegian authorities. Samal is the only city in the country that encompasses two entire islands, hence its name as the Island Garden City. While pristine beaches dot the island's shores, hills dominate the middle portions of the island. Talikud Island is located southwest of the main island. IGaCoS enjoys an evenly distributed rainfall throughout the year and a typhoon free climate, which make it ideal for agricultural production. Samal is politically subdivided into 46 barangays. In 1955, the sitios of Mambago, San Isidro, Sto. Niño, San Antonio, San Agustin, Dangcaan, Balet, Tambo, Camudmud, and Cogon were converted into barrios of the now-defunct municipality of Babak. Cebuano is the medium of language of the people of Samal Island, followed by Isama, Boholano and Tausug. The city’s economy depends greatly in its agricultural production. Copra, mango, corn, vegetables, citrus and fish are the major products of the island. Livestock production is also a major product with Davao City as the primary market. In addition, rice is also produced in the barangays of San Isidro in Babak District and Aumbay in Peñaplata District. The city is the largest resort city in the country. It has good beaches and houses many beach resorts. It has also numerous marine reefs and tranquil waters that lure the tourists to visit them, especially in Talikud Island. There are 34 registered resorts with a combined capacity of 1,000 rooms in the city. The most popular of these is the Pearl Farm Beach Resort, owned by Ms. Universe 1973 winner Margarita Moran. Because of these, the Department of Tourism named it one of the best visiting islands in Mindanao and currently one of the fastest growing tourist destinations in the country. Thus, tourism is the main source of income in the city. Biggest taxes are imposed to tourism and resort industry. Hugyaw Madayaw Festival, a spin-off of Davao's Kadayawan Festival which is also held annually in August, and also an attempt to preserve the diminishing Sama culture in the island. Monfort Bat Sanctuary, the world's largest fruit bat colony, is also located in the island. Fishing is also a growing business sector in this city, since the city was situated on the island, it cannot fully complement the demand for meat products imported from other parts of the country, especially in nearby Davao City. The city has no both container port and deep-water transport terminal, except for a barge wharf at Babak district, to deliver market products directly to the city, so the city government advocated building fishery complexes across the city to minimize the demand for market products imported to the city. Fish, pearls, and edible crustaceans such as shrimps, prawns, and crabs are the main aquatic consumable products in the city. The center of city governance is located at Barangay Peñaplata, situated at the west central coast of the island. The city has three districts: Babak, Peñaplata and Kaputian. These districts used to serve as separate towns until the 1998 city merger. Barge/ferry service or passenger boats from the Sasa Wharf & Sta. Ana Wharf in Davao City serves the island city. The modes of transportation on the island are motorcycles, tricycles or trikes, and bus and private car services offered by resorts. Island City Express (operated by Mindanao Star) daily route to Kaputian, Babak, Peñaplata from Davao City (via Kinawitnon ferry port). ^ "Province: Davao del Norte". PSGC Interactive. Quezon City, Philippines: Philippine Statistics Authority. Retrieved 12 November 2016. ^ a b c Census of Population (2015). "Region XI (Davao Region)". Total Population by Province, City, Municipality and Barangay. PSA. Retrieved 20 June 2016. ^ "Republic Act No. 5999". Chan Robles Virtual Law Library. ^ Mogato, Manuel (September 21, 2015). "Gunmen abduct three foreign tourists from southern Philippines resort". reuters.com. Reuters. Retrieved 12 October 2017. ^ "An Act Converting Certain Sitios in the Municipality of Babak, Province of Davao, into Barrios". LawPH.com. Retrieved 2011-04-11. 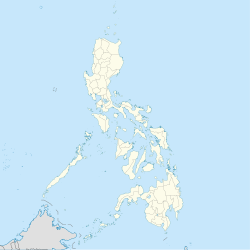 ^ "Province of Davao del Norte". Municipality Population Data. Local Water Utilities Administration Research Division. Retrieved 17 December 2016. ^ "IGaCOS bullish on tourism campaign". Edgedavao.net. 2014-03-26. Retrieved 2015-04-07. ^ "Largest colony of Geoffrey's Rousette Fruit Bat (Rousetteus amplexicaudatus)". Guinness World Records. Retrieved December 7, 2012. The Monfort Bat Colony, located in the Monfort Cave on the Samal Island in Mindanao, Philippines, is the largest colony of Geoffrey’s Rousette Fruit Bat (Rousetteus amplexicaudatus)”. As per an estimate from Bat Conservation International in 2006, the population in the Monfort cave was approximately 1.8 million. Wikivoyage has a travel guide for Samal. Wikimedia Commons has media related to Samal, Davao del Norte.